10/11/10 – Acquisitions – Cambridge, Fitzwilliam Museum – Despite the drastic budget reductions imposed on English museums, some are still able to make purchases. The question is : for how long ? 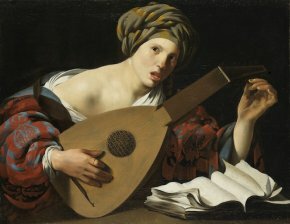 In the meantime, the Fitzwilliam Museum in Cambridge has just enriched its collections with a major Caravaggesque work, A Young Woman Tuning a Lute by Hendrick ter Brugghen (ill. 1) which was already on display at the museum as it had been lent by the owner. This is the first work by this artist to join the collections. The lute player  is a signed replica, with a few variations, of a painting held at the Kunsthistorisches Museum in Vienna. The subject is drawn directly from Caravaggio’s Lute Player, dating from around 1596, which is at the Hermitage. Ter Brugghen’s can be dated to around 1626/1627. The price was not disclosed, but the museum received 225.000 £ from the Art Fund and 50.000 from the MLA/V&A Purchase Fund. Another major acquisition was made through Acceptance in Lieu. 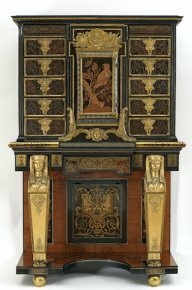 This is a Louis XIV cabinet by André-Charles Boulle himself (ill. 2), with a particularly delicate and fine decoration : the central door, adorned with a parakeet perched on an oak branch both under a butterfly, sits on lion paws and is topped by a bronze medallion of Louis XIV surrounded by military trophies. This piece of furniture resided at Wrotham Park in Hertfordshire, a private residence not open to the public. Formerly, it sat on a base with figures of Ceres and Bacchus, similar to the ones appearing on another Boulle cabinet which is almost identical to this one, held at Drumlanrig Castle. It was replaced with a Neo-classical piece, decorated with Egyptian motifs in 1795-1800. Leonard J. Slatkes and Wayne Franits, The Paintings of Hendrick ter Brugghen (1588-1629). Catalogue raisonné, Amsterdam/Philadelphia, 2007, cat. A82, p. 203, reproduced in black and white p. 391 (plate 81).